One of our Volvo XC70's is in the shop for service, so I have a 2008 Volvo C30 T5 2.0 R-Design with 45K on the clock as a loaner. Whew, that was a mouthful. 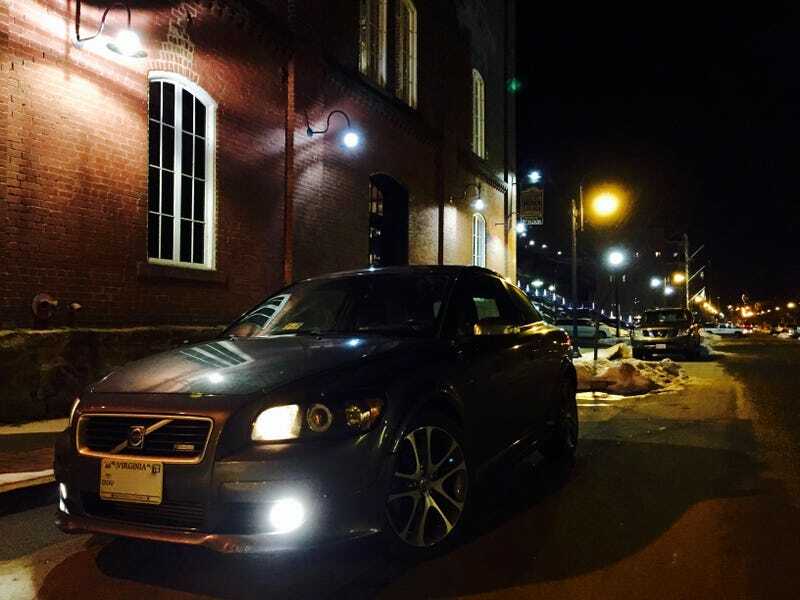 First Impressions: I have had the C30 since yesterday afternoon, and so far I have put about 80 miles on it. It’s little 2.5 liter inline-5 develops a healthy 227 HP and 236 Ft-Lb of torque, plenty enough to move it to 60 MPH in a torque steer induced 6.3 seconds. The suspension is stiff, but well damped over choppy asphalt. It has fresh BF Goodrich Comp-2's wrapped around 18 inch wheels, which offer a quite ride while still nimble handling. Body roll is kept to a minimum, but as with any 200+ HP powered front wheel driven vehicle, understeer does become an issue at the limit. Overall, I am liking it. It is fun, and much more tossable than my XC. I plan on reviewing this vehicle in-depth over the next couple days, so If you have any questions that you have been dying to ask about the C30 (or the P1 platform in general as I have spent a lot of seat time in a S40), ask away! Here are some quick iPhone pics taken Downtown last night to tie you friends over until the full review.